I don’t know if you’re aware of this but I am an avid concert goer. Every year I end up going to at least a couple summer festivals of one sort or another along with going to see bands in various places. I just can’t help myself. The atmosphere, the people, the musicians all combining to create something. I was very tempted to throw a little contest… can you guess how many concerts I’ve been to or how many bands I’ve seen? You know I actually started a list because I was losing track, honest… and I’m sure I forgot some. There is one band that I have seen a total of 10 times. Now for some people that might not be much but then again for others it’s a lot, and that’s just ONE band. So needless to say I’ve been to a lot of concerts and things over time. It’s a lot of fun, and of course I go to other sorts of festivals, outdoor events, sports things. Soooo when the Fantasy Gacha Carnival was coming around for August I was like… what do I do? And I got the rather brilliant idea of creating an outdoor festival type experience since it is the perfect time of year for it. Sad part? Didn’t get all the pieces done I was going to yet… which I am considering doing a secondary gacha to add to the first for the frivolity however what is there is there because I thought it’d be fun to pass along my love of summery type festivals and concert amphitheaters to you! Introducing!! The Summerfest Gacha set. We’re rockin out in the Roawenwood. Yepp. I so should do concert posters for this, don’t you think? Seriously, I might…. it was one of the things I wanted to do. The set has 8 pieces, so not a lot. you get a good shot at the rares. Now I got the games part done. There’s tightrope walking, there’s these rings to goof off with, and there’s an acrobatic type thing going so you can role play out a rather carnival like atmosphere. HAD to… just HAD to have an ale stall. You -cannot- have a summer concert without drunks and drunk people adding to the fun, you just can’t. I was going to do a beer tent but decided to do something else instead. Seriously one of the last shows I went to this year there was this lady who was bound and determined she knew me, barely able to stand. Kept coming up to talk to me about people passing by and all sorts of things. She was…. really interesting, *laughs* At the same show we had some other interesting experiences I must say. Then there’s the stage. Gotta have a stage. Of course this has rather multiple purposes along with a few of the other pieces. Places to sit, and I did a refuse pit. I just couldn’t resist. You know the amount of trash that ends up on the ground at most of these events… so we have a barrel that is full, and I was kinda funny… dumpster diving! Can dig round in that……….. mess or dig through it. The stage has 6 different colors of banners through texture change HUD, the log seating has room for two people to sit and has animations for male as well as female avatars. There’s a lot of fun to be had along with some practical pieces. I have tons of ideas of how to make this more, this venue and all but the pieces you see are the ones finished at the moment. I’m half tempted really to finish the rest. Needs more drunken fun along with clutter or things to muss up the scene. 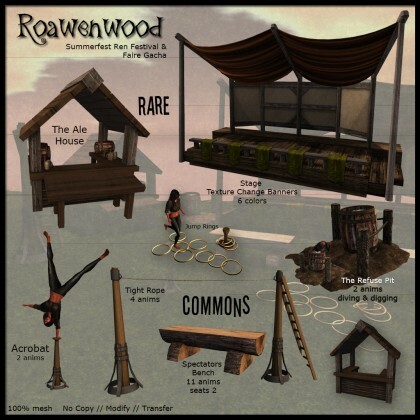 IF you want any of these pieces… since it’s a summer concert venue Roawenwood style you HAVE to go to the Fantasy Gacha Carnival. Running all this month. 40L a pull, not too terribly high. ← We <3 RP! It's Back!